Will ‘The Bont’ upgrade his Fantasy status to elite in 2017? There’s not much more Marcus Bontempelli could’ve achieved at this stage of his career. The Bulldogs used the 4th selection in the 2013 draft to snap up the then utility who had impressed at-times off half-back during the TAC Cup for the Northern Knights. Now he applies his trade as a midfielder but one who can be just as influential when given a short stint up forward. At 192cm, Bontempelli fits the mould of the modern day midfielder who oozes class, composure and precision. His evasiveness in traffic is also something to behold. In his debut season, Bontempelli averaged 69 Fantasy points before he managed 92 in 2015. Whilst helping the Dogs to the most unlikely of trophies, The Bont continued to improve his Fantasy total, averaged 98 for the season. If past seasons are anything to go by, Bontempelli’s ownership will continue to rise throughout the season. It currently sits at 19% at the time of writing. With added experience, the ability to go forward and score points through goals (as he did 22 times in 2016) and a now proven ability to match it on the big stage, I can only see Bontempelli continuing to improve his Fantasy output. Although there is no ‘I’ in team, there’s no doubting that many teams do look to get the footy into the hands of their ‘marquee’ superstars. Dangerfield is one of these at the Cats, for example. Bontempelli is another. The Bont averaged 24 touches last year which, although is still good, is down 5-8 on the more prolific types. However I can see the Dogs looking to get the ball into his hands more than ever in 2017, hopefully lifting his average disposal count as a result. As stated above, there are midfielders, like Lachie Neale and Tom Mitchell, who find the ball at will, consistently collecting upwards of 30 touches a game, but don’t damage the opposition all that much. Then there are mid’s who have perhaps 20-25 disposals but kill the opposition either through precise skills, run and carry or scoreboard impact. Midfielders that can both rack up touches and damage the opposition are rare, very rare. Ablett is one of those, JPK another. In time Marcus Bontempelli could well join that exclusive list. However at this stage, he doesn’t always manage to rack up big numbers, proven by his average of 24 disposals per game in 2016 and high of 33. Instead he relies on a healthy flow of goals and tackles. Bontempelli’s season ended as well as anyone’s however it didn’t get off to the best of starts. Despite a massive opening round victory over Fremantle, the Bont was down on his usual output, scoring 80 points. He could manage just 66 points against St.Kilda where he registered just 1 mark, 1 tackle and on goals. The lean start continued with 55 against the last team to hold the cup before the Dogs took over. Even against a rebuilding Carlton team, he was restricted to 59 before two scores of 80 in the next fortnight. Fortunately for The Bont and his side, Marcus recovered well and posted twelve tons in the last sixteen matches including hauls of 122, 125, 129 and 137. I fear that if he gets of to a poor start this season, the majority of his 19% of owners will jump off. 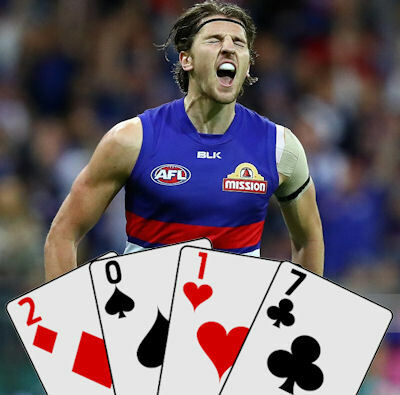 KING – I’ve given The Bont a King rating largely because he is better than a queen but not as good as Ace…yet. He is a pretty safe option in my eyes. One who I doubt would average anything under 95 but is also unlikely to get you a real high average. The Bulldogs open their 2017 account against the Pies at the MCG before hosting Sydney at Etihad. A trip to the countries west features in round three. It’s a pretty mixed bag next few games with Geelong and GWS mixed in the Brisbane and Richmond. I can see him averaging a couple of clicks over the 100 mark. Let’s hope The Bont can continue to build on his Fantasy ability by getting off to a smoother start! Will 'The Bont' upgrade his Fantasy status to elite in 2017? FOLLOW ME ON TWITTER: @handle for all thing AFL Fantasy (and more). Got something to say about the deck? Use the hashtag… #DeckofDT. I think everyone is forgetting the no third man up rule. Can’t see him averaging more then he did last year. Fyfe a much better pick. Ummmm, Bont only had 4+ hitouts in 4 games this year, with a max of 8 in round 13. Ok so lets say we take away 4 points on the higher spectrum of his HO per game, that brings his average down to 94. Now lets look at what will happen now at ruck contests with no third up rule. Rucks will now have a clean hit out to the onballers around as opposed to a third man slapping it away from the contest….what does this mean? More tackles for opposition teams at ruck contests and we all know how prolific a tackler The Bont is. So ok lets take away lets say 4 points for Bonts hit outs, and what lets plus on 2-3 more tackles a game? So will his average even drop with the new ruck rule? I certainly think it will INCREASE. Talking RDT? I’m not playing this year… but I think you have to click across from memory? If you’re talking AFL Fantasy, the scroll is working fine for me. Thnkyou Warnie, I’ll give it a go and see what happens. Not paying $600k for a guy who’s only going to ave 102. Want at least 105. Just don’t see him suddenly being an accumulator, he’ll stay as an exceptionally good actual player who is merely very good at DT IMO. Bit like Fyfe tbh, solid matches for each other.